Colored the inside of a plaid EF light blue. 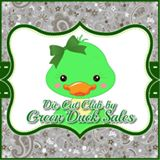 Used the darling Monkey Green Duck embellishment and added a Welcome banner. The blue plaid ribbon is a left over from one of the packages I received when my little guy was born. Adorable, Lisa. You've achieved such a soft look to this card. I was amazed to see that you made the background by coloring the inside of an EF........it never seems to work for me when I try it. Came out great for you; looks like dsp it's that good.